By taking up the challenge of documenting how human rights values are embedded in rule of law movements to produce a new language of international justice that competes with a range of other formations, this book explores how notions of justice are negotiated through everyday micropractices and grassroots contestations of those practices. These micropractices include speech acts that revere the protection of international rights, citation references to treaty documents, the brokering of human rights agendas, the rewriting of national constitutions, demonstrations of religiosity that make explicit the piety of religious subjects, and ritual practices of forgiveness that involve the invocation of ancestral religious cosmologies – all practices that detail the ways that justice, as a social fiction, is made real within particular relations of power. Clarke, K. (2009). 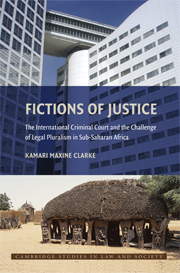 Fictions of justice : the ICC and the challenge of legal pluralism in Sub-Saharan Africa. Cambridge University Press.